Powers/Abilities: The Basilisk was immensely powerful, capable of slaughtering virtually any who encountered it. It was contained within Satana (or a pocket realm accessed by her), and released only at her discretion. It grew stronger, more powerful, and more willful with each use. Its life force was tied to hers. (Marvel Preview#7 (FB) - BTS) - The Basilisk is a powerful arch demon of Hell, an agent of Satan/Marduk Kurios, who was once the deadliest of his satanic host. It was bound to Satana at some point during her education/training in Hell under her father, as both prisoner and servant, to be loosed on mankind when Satan/Kurios would rise against heaven. 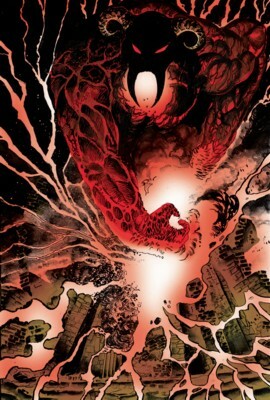 (Marvel Spotlight I#24) - Gloria Hefford unwittingly summoned and was possessed by the demon-mother Kthara, which attracted the attention of both Satana and Daimon Hellstrom. As Gloria, Kthara duped Daimon into believing that Satana was the threat, and when he confronted Satana, Kthara used her spells to goad him into combat and to enhance his power. Satana was consumed in Daimon's hellfire, but she was protected and restored by the Basilisk. She arrived in time to find Kthara about to slay Daimon in a ritual sacrifice that would allow all of her ravagers to be free to claim the Earth. Satana freed Daimon and the two struggled against Kthara and her demon-hordes, but even they had not the power to stop her. Finally, Satana summoned the Basilisk, which slaughtered Kthara and left Satana drained. (Marvel Premiere#27) - Dansker, a former hell-ruler and enemy of both Satana and Satan/Marduk Kurios, took a female host body (Deborah Hirsch) and fought Satana. Dansker was losing, so he attempted to overrun Satana with a car, leading her to release and give voice of command to the Basilisk as a defense. The Basilisk consumed Satana, but she lost a small piece of her soul to the Basilisk as well. (Marvel Preview#7) - Satana was trapped in the form of Judith Camber by the Camarilla of the N'Garai, who sought to make her more vulnerable as a human woman. Since its life force was tied to hers, the Basilisk (having gained increased freedom from Satana's lack of conscious control) slaughtered Camber's family to sever her ties to the deception. It continued to exert its influence on her, forcing her to recall its existence, and as a result, her own past. The Camarilla captured Satana and prepared to sacrifice her to their dark gods, but Satana released the Basilisk, which slaughtered every one of the 169 sorcerers present. (Marvel Team-Up I#76, 77 - both BTS) - The Basilisk manipulated Silver Dagger to attack Dr. Strange. (Marvel Team-Up I#80 - BTS) - When Dr. Strange utilized the Shiatra Book of the Damned (a version of the Darkhold), the Basilisk sent a demon to possess Strange, transforming him into a werewolf. (Marvel Team-Up I#81) - Satana traveled to the astral plane to free Dr. Strange from the curse of lycanthropy (werewolf-ism). In the process, she was overwhelmed by the demons, and was forced to summon every erg of her energy to defeat them. While this was successful, it also released the Basilisk. Satana managed to release Strange, but then the Basilisk struck her down with his flaming sword. The Basilisk taunted her, telling her she could either save Strange or herself, but not both. However, Satana only laughed, as the Basilisk was tied to her life force, and when she died, it died as well. (Journey Into Mystery I#627 (fb)) - Basilisk attended the Devil's Advocacy to talk about the Serpent (Cul)'s actions on Earth. Comments: Created by Chris Claremont and Vincente Alcazar. Technically, all appearances by Satana (before her death) should have the Basilisk behind the scenes, including her first appearance in Vampire Tales#2 and possibly even her birth as shown in Marvel Spotlight I#13. I'm guessing I'm missing some of the appearances, but I'll have to rely on input from others, or until I stumble across them again, because I don't have others recorded. Satana's back to life...can the Basilisk be far behind? The main image in this profile was colored by David Wiltfong aka DragynWulf. It was first published in the Demons entry in OHotMU Hardcover#3. Basilisk, a mythological (greek(?)) character that kills with its reflection. Although not actually seen in the Marvel Universe, it is the namesake for all others.